You will need Acrobat Reader to view this document. 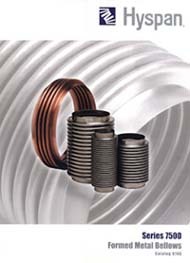 Hyspan manufactures standard formed metal bellows configurations that are suitable for most applications. Inside diameters range from 1.0" through 96.0" with a wide range of material thicknesses, convoluted lengths and materials. Complete technical information is tabulated including design pressure, spring rates and cycle life. - Inside Diameters 1.0" through 3.5"
- Inside Diameters 3.625" through 7.0"
- Inside Diameters 7.5" through 20.0"
- Inside Diameters 22.0" through 96.0"